1. Click on "New Automatic Transcription"
This will load a page where you can upload your WAV file. First, customize your transcript by choosing the timecode insertion interval, start/end positions and speaker identification. 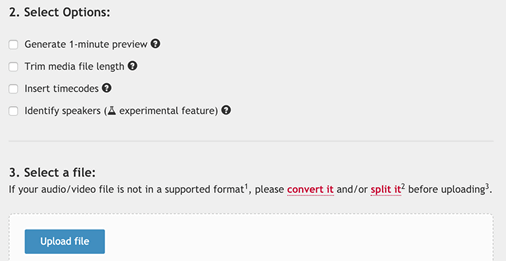 Once you're ready, click on the "Upload File" button to select the WAV file that you want to upload for convertion. When your transcript is ready, you will receive an email with a link to your transcript. Click on the "Edit" button on the sidebar to load the transcript in Transcribe's integrated editor + player for further editing. Click on "Choose audio/video" to select the WAV file again (due to privacy reasons we don't store your WAV file on our servers). Once you choose the file, an audio player will open up right above the text editor. Transcribe provides handy keyboard shortcuts to control the playback of the audio. For example, you can slow it down, rewind or skip forward using these shortcuts. Transcribe's tightly integrated player + editor makes it really easy to listen to your audio and make edits on a single screen, without juggling between a media player and a Word editor. You can speed up or slow the audio down, listen to it and just type along. Be sure to use the handy keyboard shortcuts mentioned in Step 4 to effortlessly control the audio playback to match your typing speed. Transcribe will auto-save every keystroke. The transcribed text is stored in your browser and is not sent to our servers. This data is persisted even if you restart your browser or computer as long as you don't clear your browser's cookies or cache. When you have finished editing your transcript, you can download the transcript as a .doc file to your computer by clicking on the export icon in the toolbar above the editor. The Waveform Audio File Format stores uncompressed, raw audio without any compression. WAV files consume a lot more space when compared to other file formats like MP3. However, they are preferred when you want to preserve the maximum quality of the audio. Using a WAV format also produces better results for automatic transcription of audio.